Wag's World Orchards - an authentic Western Colorado orchard- We grow the heart of Western Colorado in Delta County - cherries, peaches, apples, more! Wag’s World - We grow the heart of Eckert, CO! Try our new Apple Cider or peach and pear juice- 100% pressed fruit and nothing else! Great cold or heated! It is pasteurized and stores for up to one year. Try an apple martini, peach mojito, smoothie, jam or special pastry or simply drink this special juice straight. It is delicious. Kids love it, too! Our tasty juice and wildflower honey are available at the Montrose Farmers Market every other Saturday though May 4th, Centennial Plaza, Downtown, 10-1. Outside market starts May 11th every Saturday in Montrose. Wag's World passed our HARMONIZED GAP AUDIT with GLOBAL GAP ADDENDUM again with flying colors for 2018. This is the most rigorous of food safety requirements from the USDA and we are proud of the hard work our employees and owners have put into it. Now you, the consumer and wholesaler, reap the benefits of the hours and hours of work that went into our food safety audit. We are also FSMA certified. Wag's started our transition to be USDA certified organic in 2017. All of these audits and certifications are expensive. Your support is appreciated and keeps our family farm going! Located below the massive Grand Mesa, the largest flat-top mountain in the world, the orchards are nestled on the "valley floor", creating a more temperate climate for fruit and vegetable growing in Colorado. We are happy to report that we are having some record moisture around the Western Slope. The Grand Mesa has lots of snow this year and it will be great for agriculture and ranching. We have a unique location between the northern mesas and the southern mountains on the Surface Creek Valley floor. Looking forward to 2019's bounty with great fruit and veggies from Wag's World Orchards in Western Colorado. The Bloom at Wag’s World Orchards - The Start of Something Big! With incredible moisture from the 2019's winter, spring is blooming big at the orchard and the bee employees are getting to work. We still face spring's volatile temper and freeze in the area and are ready for it with our unconventional freeze-fight techniques. Being an orchardist means being a gambler! You bet on the best blindly and hope for the rest to score! A family farm since 1994, Wag's World Orchards safely grows superior fine fruits and vegetables at the base of the beautiful Grand Mesa in stunning Western Colorado. Operating year-round, Wag's World serves both the wholesale and retail customer with fresh and local peaches, apples, cherries, plums, nectarines, berries, and pears of all varieties AND all kinds of row crops: tomatoes, peppers, cucumbers, green beans, peas, broccoli, eggplant, herbs, lettuce, onions, squash and more! Wag's World also has pure unfiltered, unheated honey in many different sizes from our industrious bees and makes many delicious products such as Apricot Attack Jam, Crispy Apple Chips, Awesome Apple Pie Filling and Cranberry Chunky Applesauce, Peach, Plum, Blackberry, Apple Jam, Cherry Jam, Simply Apple Butter, Wag's World Apple, Peach, Cherry and Pear Chips, Ripe-Dried Tomatoes and more, to enjoy at all times of the year. Our fresh fruits and veggies enjoy beautiful sunshine and fresh water throughout the year and it shows in our quality and many different varieties of fruit. Wag’s World Orchards - We live where we grow! 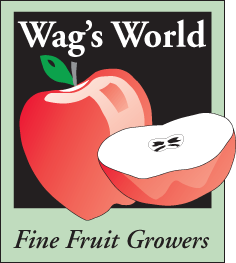 Wag's World Orchards' goal is to safely grow, the biggest, the best-tasting and the best quality of fruit for everyone at a reasonable market price. We combine safe growing practices to create a stewardship that is both solicitous of our environment and affordable for the end consumer. Our homes are right in our orchard, so we care deeply about the trees, the land and all the animals, birds and bees within. We are a food safety farm and are USDA approved for the HARMONIZED GAP AUDIT with GLOBAL GAP ADDENDUM. This is a requirement under the new Food Safety and Modernization Act for farms. We are also FSMA trained and have started our transition to be USDA certified organic. We live with numerous kinds of birds, fox, raccoons, skunks, porcupines and do our best to keep out the bears and the deer although they know where to get a good piece of fruit! It is a beautiful place overlooking Tongue Creek Valley and we never forget our responsibility to treat all with care because we live here, too! We follow all local, state and federal regulations and take great care to lessen our carbon footprint. Visit Wag’s World Orchards at one of our many state farm markets beginning each May! Wag’s World Orchards Grows All Kinds of Garden Stuff, Too! Wag's World Orchards grows all kinds of naturally-grown garden veggies in season - right from our family garden! tomatoes, chilis, squash, corn, beets, spinach, broccoli, cauliflower, onions, snow peas, green beans, herbs, garlic, eggplant and ALL KINDS of peppers and so much more! We have excellent tomatoes with 1200 plants anticipated for 2019. We are again growing Olathe Sweet Corn as naturally as possible here in our garden. We sell to wholesalers and resellers for your farm stands and markets. Call us at 970.778.5327 or visit us at one of the Farmer's Markets to get some of the freshest veggies of the season to go with our delicious fruit. Everything is field-picked and brought directly to all the Farmer's Markets or sold direct to you. in beautiful, genuine Western Colorado.